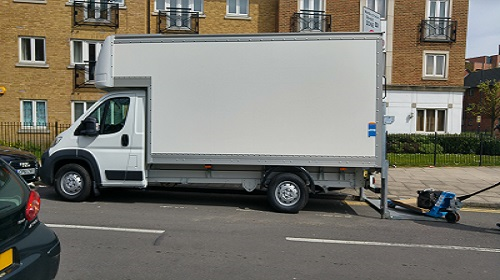 We can't give you a quote from EK HAULAGE LUTON VAN, but we have hundreds of drivers waiting to offer you a great price. Have a question for EK HAULAGE LUTON VAN? No problem, send them a message and they'll email you back as soon as possible. If you have a more general question you might find it answered in the FAQ, or you always contact one of our brilliant customer service team. * EK HAULAGE LUTON VAN won't be able to see your email address. Vlad was fantastic - worked really hard, very careful with our items, very friendly - great job. Thank you! Super happy. Very professional, thoughtful and QUICK movers. Nothing was a problem, all carefully moved to avoid any damage and nice about everything - even the unexpected need to dismantle some furniture and reassemble it again. Couldn't have been happier. Thanks guys. We note the review left by the customer Rupert. The customer did call to talk to us about the mattress but did not specifically say that he was making a complaint. Despite this, we offered our apologies but we also went further and offered not to charge him for the extra time on the job that came to about £55.00. That was waived. We assumed this resolved any issues that he had on the day which is why this comes as a shock to us. Professional. Cracked on with the work. No hesitation in recommending these removal team again. Value for money. Brilliant guys, would use them again! Great service! I requested a Luton van with driver and helper for our 1-bed flat removal, had hired for 3 hours but all accomplished in about 2 hours! No hesitation in recommending, and I would use this company again. Thank you! Lovely guys, were polite, friendly, efficient and patient, overall great service! Excellent and professional service! I have saved their number for future. Fantastic service all around. Very happy with everything. The driver and the helper were both fantastic! I had underestimated the volume and time but they finished the job anyway without any problem and with a great attitude. I am very pleased and would recommend these two guys to anyone who wants a smooth nice move. They were so helpful, would not hesitate to book the same team again. We could not imagine a move going more smoothly and efficiently than with these guys. On time (even 10 min. early), pleasant, polite, hard-working and professional, they even made light work of our very heavy piano up a flight of steep stairs, and with a smile. I just wish more professionals handled themselves like these guys! Could not recommend enough. It was a great experience, Mike made the whole process simple and easy, and we finished up far sooner than expected. Nice large Van and a great driver! The moving was grand. Mike was smart, quick, efficient and treated us as if we were his friends closest friends. Highly recommended driver. The driver was 30 mins early, they were organised with packing and unpacking and finished well before time. Excellent service and with only 1 days notice got moved from London to the midlands, with no hassle. Utterly professional. Hugely helpful. Very willing to be flexible. I would use them again in an instant. Managed to accommodate us at very short notice. Ken, who I believe is the owner, did the job himself, very professional, helpful and pleasant to deal with. My husband, who did the move with Ken was hugely impressed and also said what a nice guy he is. Would not hesitate to use again and recommend. Excellent service and move, Alex made the whole thing easy. Took good care of my items and helped enormously. Highly recommended. They were great and on time. We had rather heavy mattresses and I needed them to dismantle my beds and reassemble at location. They acted as pros and did everything in a very timely manner. Super impressed. Quick, efficient and generally really helpful and friendly - would be my go to people for moves and man and van services! Thanks for making moving as painless as possible!! I received an excellent service. The driver and his mate were bang on time, were more than happy to help me move all of my items and also carry my old washing machine down the two flights of stairs for disposal. Great job. The driver was really nice and extremely helpful. We would highly recommend this driver. Great service, very nice people, super efficient, had absolutely no issues! Thank you so much for helping us to move! They were really good, on time and treated our stuff with care. I was especially surprised by how they made the fridge freezer get down 3 flights of stairs and didnt complain or curse. I will use them again and will recommend them to my family and friends. If youre thinking about using these guys, you should. Very impressed. THe driver was great - he was very helpful, friendly, and careful. Definitely recommended.. Excellent service, hard working and polite. Would recommend highly. Would use again! Lovely chaps and very businesslike - they got to work straight away and were exceptionally efficient. The move was quick, easy and stress free. Would definitely call on them again! I would highly recommend my driver, great service & made life very easy! Thank you for making our move less stressful than it already is. Ken and Mihai were very professional and did a fantastic job. They turned up on time and fully prepared for the move. They inspected all of the items we had and decided a strategy to load up the vehicle. They carried the heavy items and took great care with the delicate pieces of furniture. They didn't moan when the sofa couldn't fit in the lift and carried the item up 4 flights of stairs. They were friendly and put our mind at ease and what can be a stressful process. I would highly recommend their service and would use them again next time I need to move. I would also recommend to other users that it is worth hiring two people as it speeds up the process and reduces the pain of the moving process. Perfect service! I was helped by Ken and he was extremely helpful, punctual and friendly. I definitely recommend it! Ken was brilliant. Lovely guy, really helpful and made what could have been a very painful day, much more straightforward! Both driver and his assistant were most helpful, friendly, courteous and efficient. On time, friendly and helpful - would definitely use the service again! Very prompt and courteous, very helpful all round I would certainly recommend anyone to use. Amazing service ! Alex is the best ! Thank you for everything !!! Definitely would use again and recomend it ! Alex the van driver and his two mates were very helpful and didn't shy away from doing the heavy lifts. I was quite impressed and overall a very good move. Nice one guys! Excellent service, except that, in a move from a storage depot, a couple of pieces of a bookshelf were left in the store by mistake meaning I had to move them myself later. That aside, very good. Alex was absolutely excellent. Methodical, professional and friendly. Almost makes me want to move again!